SOREL: whose brother was shot in the eye. In February 2004, Haitian president Jean-Bertrand Aristide was removed from office and secretly flown out of the country accompanied by US military personnel. The circumstances surrounding Aristide’s departure remain contested. Contemporary accounts refer to his “resignation” and describe him “fleeing” the country, whereas Aristide has labelled his removal from office a “coup” and his removal from the country a “kidnapping.” Aristide’s successor, Boniface Alexandre, immediately pressed the United Nations for peacekeeping support. Haiti was not at civil war, but there was much civil unrest: the countryside and cities were plagued variously by right-wing militias and death squads, crime gangs, and looters. That spring, UN teams assessed the situation in Haiti and in June 2004 primary UN peacekeeping duties were passed to the newly created United Nations Stabilization Mission in Haiti (generally referred to by its French-language acronym, MINUSTAH). Although primarily considered a policing mission with a peacekeeping directive, much of MINUSTAH was made up of military forces – a multi-national force, but mainly from Brazil – and many of its difficulties stemmed from confrontations with criminal gangs inside some of Haiti’s most impoverished neighbourhoods, including the Cité Soleil neighbourhood of Port-au-Prince. Almost since its arrival in the country, charges have been levied against MINUSTAH for such atrocities as excessive use of force, sexual violence, and the killing of civilians, crimes which MINUSTAH and the UN mostly deny. It Stays with You: Use of Force by UN Peacekeepers in Haiti is a 2017 documentary directed by Siobhán Wills and Cahal McLaughlin that addresses a series of heavily militarised MINUSTAH raids on Cité Soleil that took place between 2005-07, in particular one devastating raid, known as Operation Iron Fist, that was carried out on 6 July 2005. That single operation included the use of 22,700 firearm cartridges, 78 grenades, and 5 mortar shells, in the middle of a densely packed civilian population. While the UN has admitted to “some civilian casualties,” estimates of the number of civilians killed during Operation Iron Fist range as high as 80 and include children and the elderly. It Stays with You breaks its story into roughly three sections: testimonials from survivors and others on the ground about the human loss and destruction of the raid; discussions with human rights experts about the ethics and legality of MINUSTAH’s actions; and further testimonials about life in Cité Soleil in the decade after the raid and the traumatising nature of the residents’ loss. This structure is effective for a number of reasons, not least of which is that sticking to a chronology of the event itself, its immediate aftermath, and its long-term repercussions helps viewers make sense of a chaotic series of events. More importantly, however, is how this structure allows for the immediacy of the film’s appeal to viewer empathy. The film opens with three brief title cards that clarify the situation in Port-au-Prince in 2005 and includes a few establishing shots of Port-au-Prince street scenes, including from Cité Soleil where MINUSTAH has set up a perimeter with entry checkpoints. Then the residents start talking. It Stays with You practices participatory filmmaking in which the community takes part in the crafting of the film, so that the community helps determine how they will be used within the film. Thus, aside from the opening titles, there is very little in the way of contextual set up – this film is about what happened during Operation Iron Fist, and the residents who have agreed to be filmed jump right in to talking about the raid. One Haitian after another gives detailed descriptions of the extremity of the raid. Speaking from their own homes, mainly corrugated shacks with makeshift plywood panelling interiors, they describe an environment of fear, shooting every day, and great difficulty not only getting in and out of the neighbourhood, but even of being able to leave their own homes. MINUSTAH patrolled the area with armoured transport vehicles and helicopters (the helicopters are of particular importance: bullet holes in the roofs of the homes indicate firing from above, and MINUSTAH, but not the local gangs that MINUSTAH tried to blame much of the violence on, had access to helicopters). As they describe this climate of fear, the stories rapidly become more personal, and very early in the film, one resident, Victor Jean, is openly weeping about the death of his daughter by gunshot. From that point on and for nearly twenty minutes, the residents of Cité Soleil describe in horrendous detail the injuries, maiming, and deaths of their close family members – parents, siblings, and young children – most of whom were sliced apart by powerful bullet spray that penetrated their homes with ease. 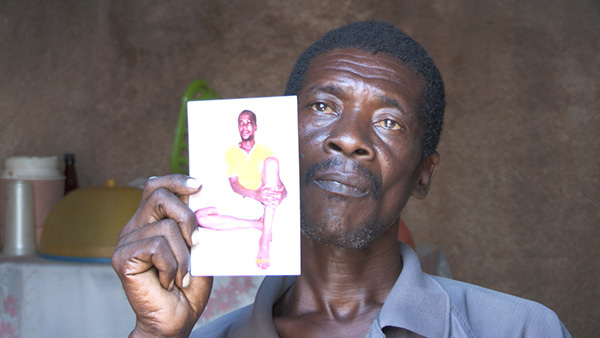 A very young man, Shelson Cajuste, claims that although the gangs were already gone, MINUSTAH were “shooting and hot-headed,” which resulted in the wounding of his father and the death of his baby sister, both shot while inside their home. These accounts are all relayed talking-head style – apart from a few title cards and establishing shots sprinkled throughout, the entire film comprises talking heads. The effect, particularly in this first section, is striking. As a testimonial, one of the best decisions the filmmakers have made is to let these residents speak for themselves, often looking directly into the camera. The result is harrowing, not only in the descriptions of violent death, but also in story after story about the hospitals and morgues that were unequipped to handle the carnage. Eveline Pierre describes the burial of her baby: “we had to dispose of her down on one of the islets by the sea.” She’s thankful, however, that she only lost her husband and one child. Like many of the participants in the film, she conveys a deep sense of fatalism. For nearly every individual, after their heart-breaking descriptions of injury and loss, they are resigned to defer to the inevitability of God’s plan. One gets a sense that many of the residents, voluntarily or not, have ceded some of the control over their lives to forces outside themselves. These first two sections accomplish two different but complimentary tasks. First, they chronicle MINUSTAH’s actions during the Cité Soleil raids and cast serious doubt on their legality. In doing so, the film is more than just a powerful testimonial, but also an investigation into illegality that has to this day gone unpunished. A second accomplishment of the first two sections is to tie the events in Haiti into a broader context of the increased militarisation of police keeping throughout the world and its detrimental effects on civilian lives, especially black civilians. While the film itself focuses its attention squarely on events in Haiti and their aftermath, one cannot help but connect them to increased instances of militarised police keeping in places like Brazil, the Philippines, the United States, and elsewhere. As the concept of “security” continues to blur the once clear demarcation between the police and the military, it remains vital that incidents like Operation Iron Fist not be simply swept under the rug. Part of the power of It Stays with You is its combination of vivid testimony and frank legal and ethical clarification. For its final section, the film returns to the residents of Cité Soleil. Between the events of Iron Fist and the other major MINUSTAH raids on the neighbourhood and the making of the film, ten years have passed. Ten years that the residents have lived with their loss and, as the footage of the neighbourhood shows, are still living with both MINUSTUH’s presence and the physical destruction that was wrought upon their homes. And yet, even after ten years, the pain of what happened during those raids is still intense, and emotions quickly surface. In addition to the agony of losing those closest to them, the residents of Cité Soleil have had to live with the practicalities of those losses. Loss of income, loss of childcare, loss of purpose in life. Sisters Diorlie and Modeline Dorcius describe how devastating the loss of their father has been. For Diorlie, it’s meant that the family has lost its faith as they no longer go to church. Modeline is heartbroken because with her father’s death, she’s had to remain at home to work, which means she was never able to go to school as she had planned. She says her life is over. These final testimonies make clear the long-term nature of the devastation caused by MINUSTAH’s actions in Haiti. With a running time of just under fifty minutes, It Stays with You is compact and precise. Eschewing common documentary practices like voiceover narration or expository framing, the film centres its participatory-based practice on the residents of Cité Soleil. This is vital to the story being told – a story that has been overlooked by much of Western journalism and the world at large. There is an immediacy to their stories that needs no burnishing by extra-narrative production strategies. In allowing these people to tell their story directly, It Stays with You is a fine example of how participatory filmmaking can blend investigation and testimony to fill a gaping hole in the historical record. In a separate series of incidents from 2007, over 100 MINUSTAH soldiers, mainly from Sri Lanka, were charged with sexual assault in Haiti. Most of these soldiers were discharged back to Sri Lanka with no charges filed, despite the UN accepting claims of widespread sexual abuse. MINUSTAH’s mandate in Haiti officially ended in October 2017. It was replaced by the United Nations Mission for Justice Support in Haiti (MINUJUSTH), which includes police and civilian officials, but reportedly no military personel. Aaron Hunter lectures in the department of media studies at Maynooth University, Ireland. His work has appeared in SCOPE, ALPHAVILLE, and the JOURNAL OF FILM AND VIDEO, and his monograph AUTHORING HAL ASHBY: THE MYTH OF THE NEW HOLLYWOOD AUTEUR was published by Bloomsbury in 2016.